Programmeerbaar licht systeem voor verlichting op schaal, nacht vliegen, sport verlichting op vliegtuigen, auto's etc. De starters kit bevat de controller incl. de led's (lampjes) en de bekabeling. The DELight Starter Kit combines all the components of the DELight programmable lighting system into one package. It consists of a programmable lighting controller, software for creating customized lighting sequences, a USB link cable to load the programs and ultra-bright LED lights. Everything you need to create scale, sport or nightflying effects for R/C airplanes, cars, robots or special effects is included. The DELink software is easy to use and completely graphical. A simulator allows you to preview and fine-tune your programs. Infinite undo (even inside saved files) means you'll never have an 'oops' moment. The software is a free download, so you are welcome to download it before purchasing the system in order to verify that you can achieve the effects you want. The DELight Ultra Bright LEDs are the brightest LEDs ever used in an R/C lighting system. They are up to 15 lumens each and can each draw up to 150mA. Not to worry, the DELight controller can handle this level of power, and if you're worried about blinding yourself, the controller has programmable brightness! The DELight Controller has eight output channels. It contains onboard non-volatile memory to store your programs, and the power electronics required to sequence and dim the LEDs according to your command. 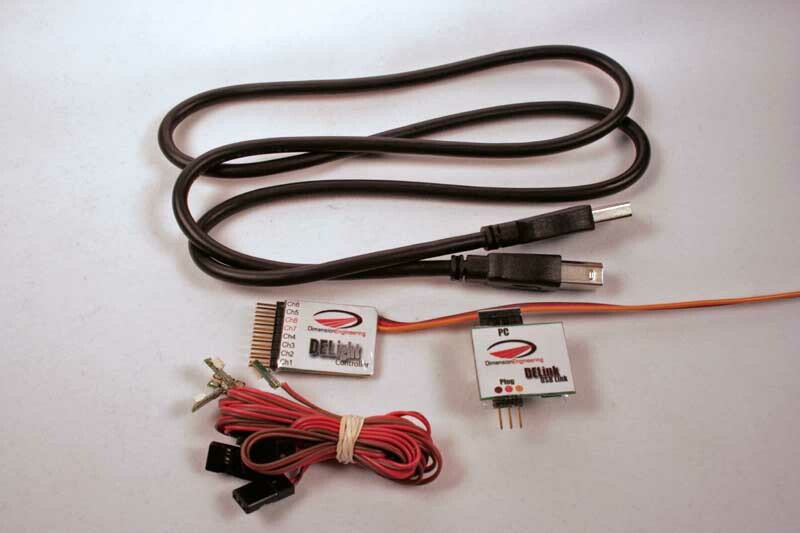 It is connected to your receiver through any spare channel (or use a Y harness.) The point at which the sequences turn on or change is programmable, so effects such as landing lights are easily accomplished. Two of the programmable channels are even higher powered - up to two amps on/off, and can be used to power things such as glow-wire inverters or bomb drops, in addition to powering LEDs.